… without reinstalling service manager portal. Quick tip for the following scenario: you have a distributed Service Manager infrastructure with the Service Manager Portal installed on a system that is not the management server nor the data warehouse server. In this configuration when you try to install the Operations Manager 2012 agent (SP1 or not doesn’t matter) the setup won’t complete stating an incompatible module has been installed on the system (i.e. the Service Manager Portal). Obviously you can remove the service manager portal and reinstall it. If you don’t want to, then this post is for you. A little background: prior to System Center 2012 SP1 the only way to monitor service manager was via agentless monitoring or by installing the Operations Manager agent before Service Manager. With SP1 the service manager management servers (i.e. the management serevr and the data warehouse roles) install an OpsMgr compatible healthservice. You can configure the agents via the OpsMgr control panel applet: they’re treated as manually installed agents. The point is when you install the service manager portal on a separate system, the OpsMgr “compatible” healthservice is not installed and the agent refuses to install. The OpsMgr windows installer package checks for a known list of “incompatible” products, this check is done querying the windows installer database for product specific guids (you can check via powershell get-wmiobject –class Win32_Product). 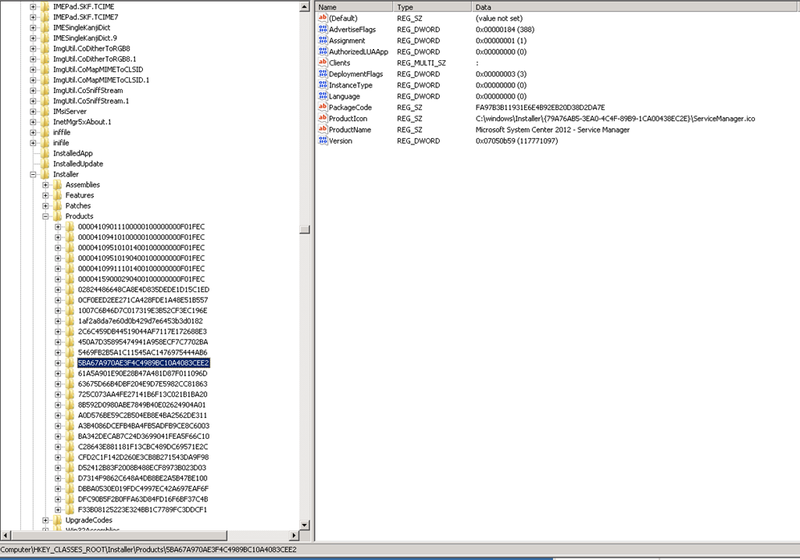 The trick consists in “hiding” the service manager installation for the time needed to install the OpsMgr agent. Obviously you’re hacking the registry so do it at your own risk. This entry was posted on September 20, 2013, 7:02 am and is filed under SCOM, Service Manager, System Center. You can follow any responses to this entry through RSS 2.0. You can leave a response, or trackback from your own site.